These current students are happy to share their experiences of all facets of the Rotman Morning MBA and Evening MBA program. Have questions about getting in, making the transition back to school, or juggling the demands of work, school and life? Rotman ambassadors are current students who have volunteered their time to help you make your MBA decision, and are ready to share their experiences of the program. They also help those on track to study with us feel prepared for what lies ahead. Read their bios to find the ambassador who is the best fit for your questions. Email an ambassador by clicking their name. Saad is currently working as a Technical Solutions Lead at Rogers. He provides high-tech network solutions to large enterprises in Canada. "I chose Rotman because it has the largest alumni base in Canada. Having worked with past Rotman alumni, I have experienced how they even make people around them successful. Graduates of this program have a different way of thinking, which distinguish them from others. Rotman has a prestigious reputation and I want to help raise it even further." Arjun works as a Project Engineer at Mott MacDonald, where he consults in the design and construction of large infrastructure projects. He is interested in transitioning into business strategy consulting after completing his MBA. "I chose Rotman to do my MBA because of its central location and its flexibility for working professionals. Being able to do my MBA while working full-time was very important to me, and it has the added bonus of giving me the opportunity to apply the concepts I am learning in school to my job." Mohammad leads projects in disruptive ICT, blockchain, and big data systems as an ED with Soptimizer, and as Chair of IEEE Standards for Software-defined and Virtualized Ecosystems. He has significant experience spanning several industries and academia. "Rotman is the best school in Canada with world-renowned faculty members, and the University of Toronto is one of the best universities in the world. World-class faculty plus an extraordinary class profile infused with several transformative opportunities is the perfect combination to choose." Malek is currently working as a Manager for the technical services department for a global medical device manufacturer, where he overseas strategy and operations. 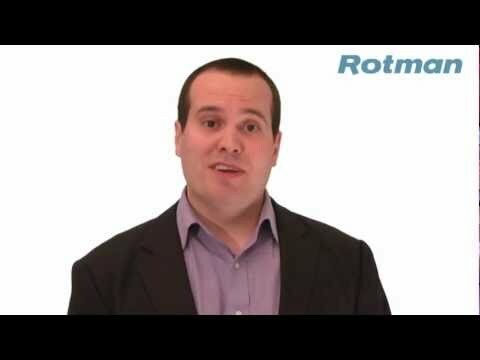 "The Rotman School of Management's reputation speaks for itself and choosing Rotman as my preferred school was a given. The healthcare management major is what convinced me to pursue my MBA at Rotman –- a one-of-a-kind program in the heart of one the most diverse cities in the world, with top faculty and an amazing campus." Solveiga is a compliance and risk management professional who has been working in the finance industry for over ten years. She is an international traveler with a keen interest in volunteering. "The Rotman MBA provides the appropriate scholastic tools, intellectual stimulation, exceptional student and peer community, as well as transformative experience necessary to best prepare to take on the challenges and opportunities associated with greater responsibilities at higher managerial levels." Zeshan entered the world of financial services in the field of audit. He’s currently a Senior Audit Manager at CIBC and specializes in global markets and investment banking. He volunteers as an audit committee board member at ACESS Employment and actively mentor young professionals to bring out their best qualities and help them in their careers. "I believe in excellence and an insane amount of hard work to achieve it. Rotman’s reputation, teaching style and critical thinking approach matched my personality." Casey is currently working at Scotiabank in Global Capital Markets and her interest is in finance/capital markets. Before joining Scotia, she worked at another bank in sales and trading for several years. "I chose Rotman because it has a prestigious name on Bay Street and has an extensive alumni network. It also provides convenient access (location and schedule) for working professionals to achieve their degree."